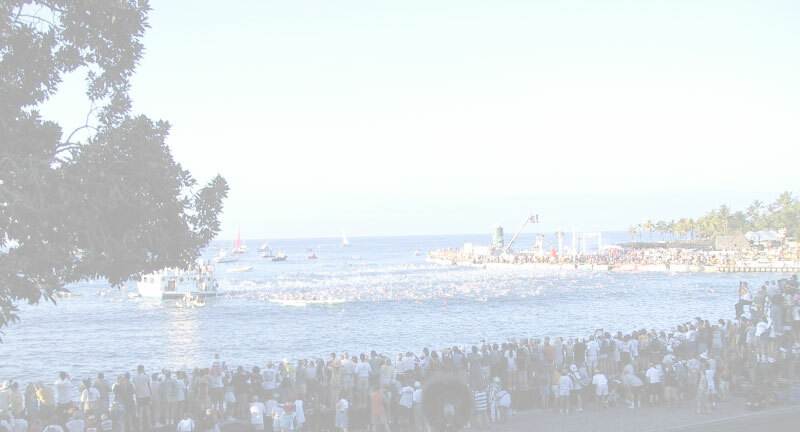 The water of Kailua, Kona churns white as the triathletes, bunched together tighter than clothes in a washer, begin the race. The Hot Corner cheering on Peter Russo from Rumford, RI. Since the first race in 1978, the Ironman has stirred people of all ages, sexes, creeds and colors in an endeavor of self-improvement that encompasses every aspect of life.The sport has changed the way we eat, sleep, work and play and has offered us the opportunity to expand the quality of our lives beyond what any of us thought possible. In terms of history, the 1982 Ironman may be the most significant. Julie Moss leads the race until she is just feet from the finish, only to collapse. As she crawls to the tape, Kathleen McCartney passes her and wins the race, completely unaware of Moss' predicament or her own victory. ABC records the entire ordeal on film. When Moss' struggle is aired on Wide World of Sports, thousands around the world are inspired by her determination. Julie Moss 15 years later on her way to a second place age group finish. It was after a few beers in 1978 and what some thought were only casual jokes about who was the better athlete--young men or old men; swimmers, cyclists or runnes--that John Collins stood before the crowd gathered at the Primo Brewery following the Around the Island Relay Race in Honolulu, Hawaii. He posed a "ridiculous" challenge--a 2.4-mile swim off Waikiki Beach, a 112-mile bike ride around Oahu and a 26.2-mile run through the streets of Honolulu. 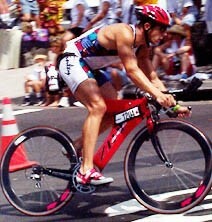 Smaller swim-bike-run events had been held in San Diego, California's Mission Beach area for a couple of years. But it was this bizarre event, more than anything else, that would draw hundreds of thousands of people around the world into a almost religious following of the sport we now affectionately know as "triathlon." 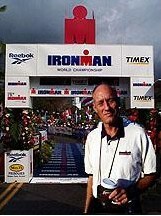 John Collins at the finish line of this year's Ironman.